Message boards : AstroPulse : Astropulse is back! The first new astropulse results are appearing. We only have an x86_64 application ready. Josh will be compiling other linux and solaris in the next few days. Maybe even MacOS. No graphics yet. That's mostly my fault. Message 13940 - Posted: 31 Jan 2007, 2:17:19 UTC - in response to Message 13937. Great progress! Keep us posted! Congrats. Message 13953 - Posted: 31 Jan 2007, 8:46:50 UTC - in response to Message 13940. Message 13954 - Posted: 31 Jan 2007, 11:21:26 UTC - in response to Message 13953. 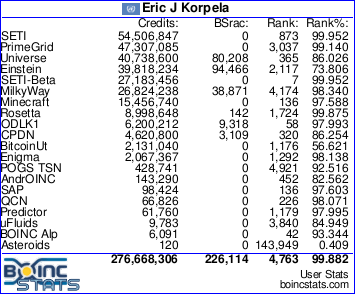 Is Boinc going to come out with a win and lin 64bit editions??? Message 13956 - Posted: 31 Jan 2007, 11:26:14 UTC - in response to Message 13937. Great news Eric! Congratulations for the entire team. I guess now will be a waiting game to see which one of us will be the lucky one. I guess I'm out... only a regular 32bits XP here. Message 13968 - Posted: 31 Jan 2007, 14:02:51 UTC - in response to Message 13953. 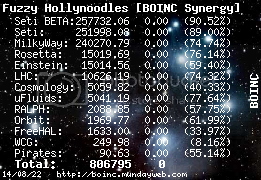 I'm running XP64 and using Crunch3r's 64bit Boinc client (5.9.064) and I'm having no luck getting an Astropulse wu. I'm getting the same message as Astro. I don't how accurate the info is, but the Beta apps page is stating that only intel-based, 64-bit Linux machines have an application ready for work :( A little more patience. The 32bit windows version should released soon. This morning Alinator just spotted a host that managed to download a AP WU. But what about the rest of the processes involved in crunching a WU? Validators, Assimilators, etc, etc... are those already in place? What can you tell us? Anyway, I said it before and I'll say it again: a great accomplishment. What's scarey is that Eric stated that Linux versions would be available in the coming days, but the one Alinator found is dated the 31st, the same day eric posted the message. Perhaps that user is Josh?? ?, If so why is he using Boinc 5.9.0? Also, what is the magic combination to actually get an AP wu? I couldn't with winxp pro 64 or a 64b linux with a 64 boinc. It keeps deferring for 24 hours, but I keep updating. What's the secret??? Message 14006 - Posted: 1 Feb 2007, 17:26:20 UTC - in response to Message 14005. I'm investigating the reason for the lack of work right now. Probably a problem with the feeder or transitioner. Message 14012 - Posted: 2 Feb 2007, 0:07:06 UTC - in response to Message 14005. Maybe you need an AMD 64 with 64 bit Linux. Message 14016 - Posted: 2 Feb 2007, 1:16:18 UTC - in response to Message 14012. I believe Tony only has AMD's except maybe for an odd laptop or two. And with all his attempts to become a Linux master, in 3 months, would have thought he would have worked out the combination. LOL, Yes, I have a 64b linux with a AMD64. NO soap. Message 14033 - Posted: 2 Feb 2007, 5:35:30 UTC - in response to Message 14022. That's a known BOINC problem that isn't yet resolved. The plaform this project uses is "x86_64-unknown-linux-gnu." I keep meaning to implement platform aliases, but so far I haven't been able to find the time to do it. Message 14052 - Posted: 2 Feb 2007, 10:57:23 UTC - in response to Message 14022.